The student startup Socio Labs LTD is revolutionizing the way information can be exchanged through a "digital handshake." 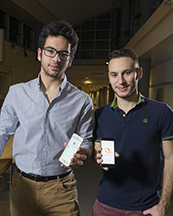 Purdue University students and co-founders are from left: Yarkin Sakucoglu, CEO and a sophomore in Purdue Polytechnic Institute, and Alihan Ozbayrak, a senior in computer science and civil engineering. WEST LAFAYETTE, Ind. - Exchanging information for the many social media networks, emails and phone numbers can be quite a hassle, and having to look for people on each social network one-by-one gets tedious. 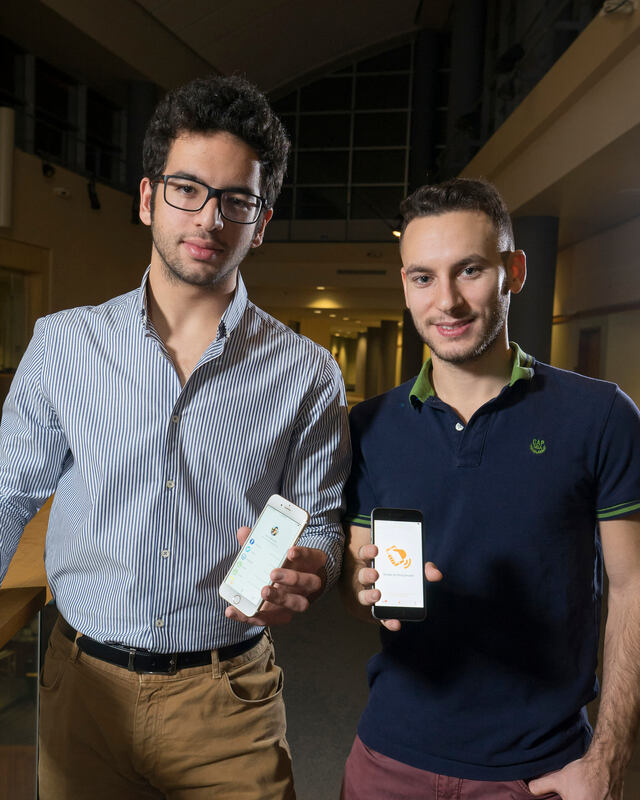 Co-founders Yarkin Sakucoglu, the CEO and a sophomore in Purdue's Polytechnic Institute who also is studying for a Purdue Certificate in Entrepreneurship, and Alihan Ozbayrak, a senior studying computer science and civil engineering, are the developers of the Socio app. Socio links users' information, including email, phone number and social media accounts such as Facebook, Instagram, Snapchat, LinkedIn and more into one Socio profile. When users want to share their information with each other (or a group of people), they can give a quick phone shake and all of their information is instantly swapped, providing both users give consent. "You don't have to copy and paste account information into each app one-by-one, or pass your phone to people asking them to type in their usernames or numbers. What normally takes two to three minutes now takes less than 10 seconds." Ozbayrak said. "Whether connecting with just two people or 200, you just shake and connect." "When there is a change in a user's contact information, all they have to do is update their Socio profile and all of their connections are notified instantly. The possibilities for connecting are endless," Sakucoglu said. 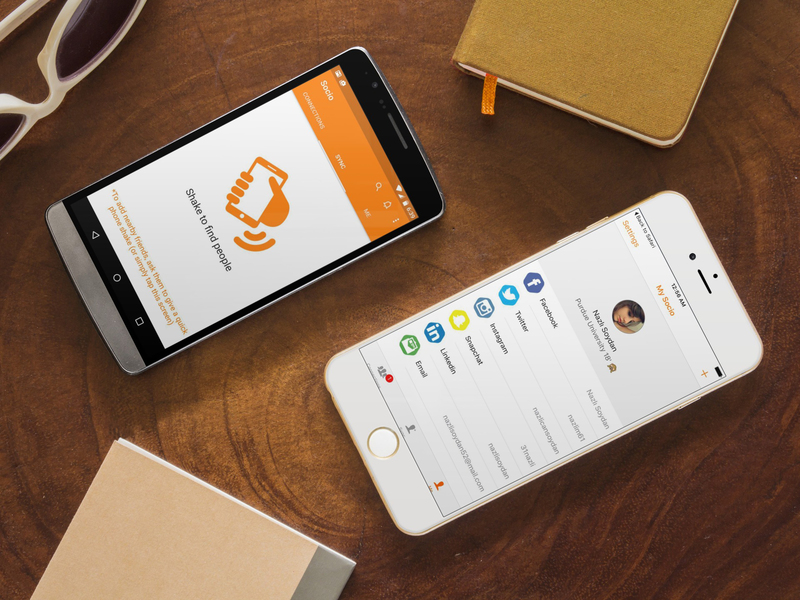 Socio Labs technology makes connections faster and easier through a “digital handshake.” The Socio app is available for free on both the App Store for iOS users and Google Play Store. The app also can connect users who are not in close proximity by enabling them to search for one another on the app. Socio has already garnered significant successes in the short time span that it has been on the market. Upon its release in Turkey, Socio obtained nearly 10,000 users and became a trending social media application within 15 days. Eager to translate their success in Turkey into the United States, Socio already paved its way to prominence by becoming one of the five companies to obtain a mentorship opportunity by the Silicon Valley Boilermaker Innovation Group, or SV-BIG. 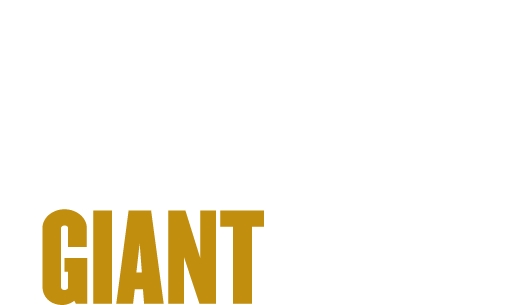 They have also become a client of Purdue Foundry, Purdue's startup hub. The Socio team also includes three other members, who are, Joseph Watkins, Eren Ozer, and Elcin Can Cavusoglu. Socio is available for free on both Apple’s App Store for iOS users and Google Play Store. Download links and more information regarding Socio can be found at atsocio.com.